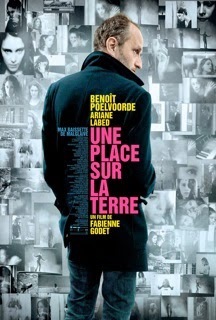 Movie Review: After her directorial debut in 2005 with “Burnt Out”, followed by the documentary “My Great Escape” two years later, Fabienne Godet presents us now her second fictional drama with “A Place on Earth”, a story about obsession, depression, and self-confidence. Antoine Dumas (Benoit Poelvoorde) is an alcoholic photographer whose latest works aren’t having the desired results in the agency he works. Instead of going to another boring New Year’s party, he decides to stay home, taking care of his best friend, Matéo, the little son of his constantly absent neighbor. Allured by Chopin piano pieces played by Elena (Mariane Labed), a neighbor who lives across the courtyard, Antoine will be witness of her suicide attempt. The woman survives and Antoine will develop a strange obsession for her, retrieving little by little his self-confidence. The film oscillates according to its characters, showing pondered moments in one hand, and occasionally bursting of interior liberation needs, in the other. Intriguing only in its first part, it started losing interest as the end approached and became indifferent as its mysteries revealed to be ineffective. The subplots, regarding Matéo or Elena’s addicted friend Margot, didn’t add anything relevant to a drama that failed to provoke or stimulate our minds. Godet tried to use depression as her best trump but the conclusions/moral that passed in “A Place on Earth” were too contrived to achieve admirable results.